Remember the bad old days? When you used your Yahoo! 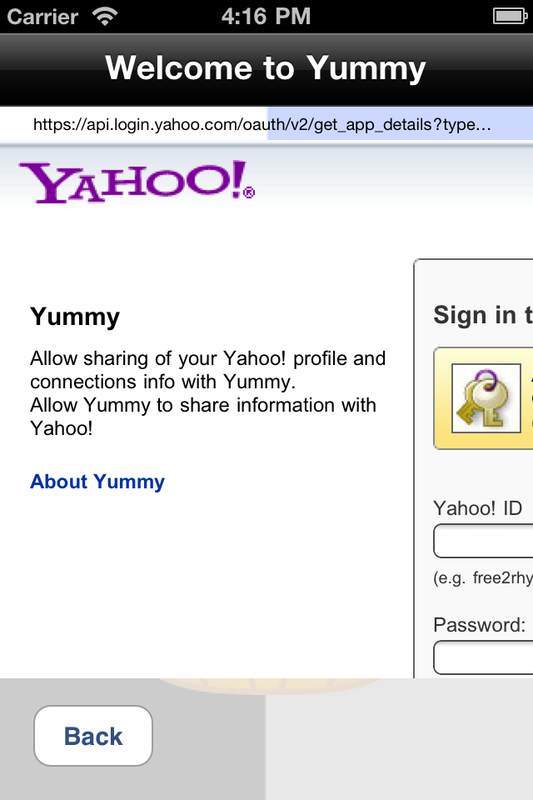 ID to log into Yummy you had to leave the app, go into Safari, remember a number… Well, it wasn’t really that hard but there were more steps than I wanted. Now you never have to leave Yummy how ever you log into Delicious. This behaviour is actually contrary to the OAuth spec but the user experience is so much better and simpler I thought that it was worth breaking some rules. Yahoo! do not serve a mobile-optimised web site so it requires a little scrolling around, but I still think that this is more convenient that switching over to Safari and back again. Of course, this works better on the iPad, which has a much bigger screen. Why the “experimental” label for Pinboard.in support in Yummy 2.5?